Evile's second album marks a genuine milestone in thrash as the band effortlessly ups the ante, propelling the UK thrash outfit into the big leagues. 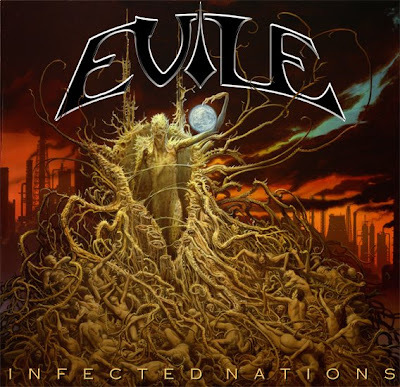 On 'Infected Nations', Evile takes thrash metal's '80s blueprints - ripping riffs and shredding solos - but refines them into a wholly more ferocious and modern beast. 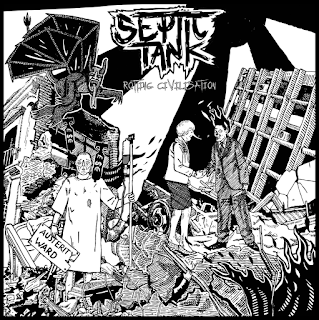 Having undertaken touring stints with MEGADETH, EXODUS and big shows with MACHINE HEAD, the band emerged from the studio with a new-found sense of dynamics, maturity and bag-fulls of catchy-but-pounding songs. Still proud to call themselves thrash metal, Evile just raised the bar for their fellow new-schoolers to strive for. Okay so album number one was a great album (I had to buy it twice, second time for the dvd) but it was more than a bit overshadowed by some serious "Slayer Worship", this time however they had been writing for sometime, matured and found a brilliant producer with Russ Russell (Napalm Death, Nemhain, Dimmu Borgir). Kicking off with 'Infected Nation' its mellow intro soon gives way to some classy thrash and it soon becomes obvious that the band have found their own style and that Matt has had a revelation vocally and really comes into his own here. 'Now Demolition' moves along like part two of track one, it has the same groove. 'Nosophoros' borders on speed metal and has some great guitar solo's in it, one to crack the neck live i think. 'Genocide' is the first mini epic coming in a 7 minutes 42 seconds, it's slow paced and a real "grower" (If that makes any sense) "These demons are only men" go the dark and well written lyrics. 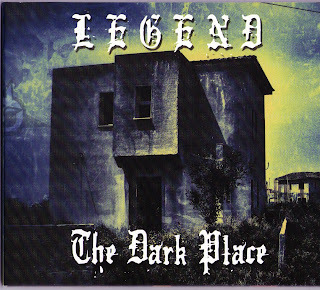 'Plague To End All Plagues' is another mid paced headbanger punctuated by some evil chords. 'Devoid Of Thought' is pure early eighties thrash as is the next track. 'Metamorphosis' has some great bass work running through it and is another 7 minute epic. Finally we come to the awesome 11 minutes and 14 seconds of 'Hundred Wrathful Deities' some beautiful guitarwork leads us into slow almost doom like thrash, plenty of harmony guitar work and a few solos, but most surprisingly of all its an instrumentle! A stunning and mature album and one which will stand the test of time for the next twenty years, as i believe Jimmy Frankles would say Brilllliaaannnntttt! Total respect here as well to Earache who are releasing a 2 disc version to start with, thus not taking 2 lots of money off the fans, and thanks for the advanced copy.